Some of the team took a mini road trip up to Boulder in search of young, eager individuals looking for an internship. 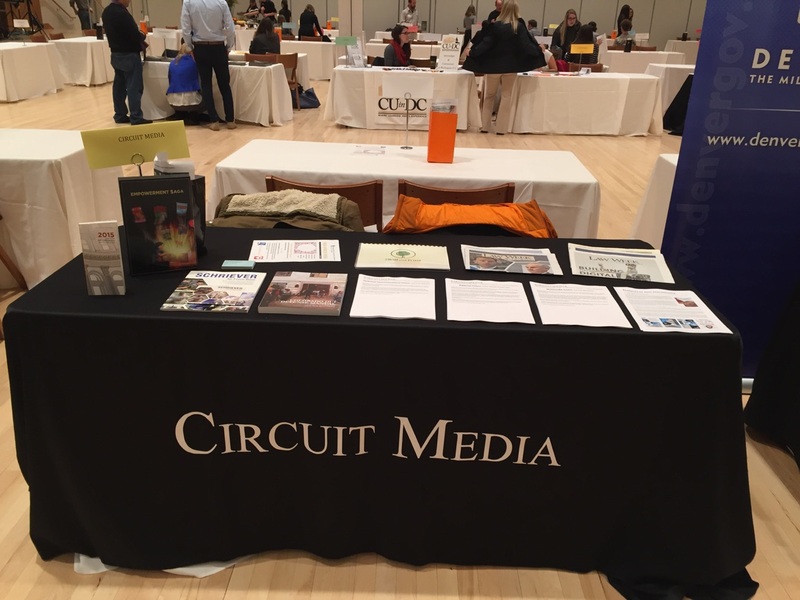 Our editorial and technical communications teams and Locus Studios squad were all well-represented during last week’s CU Boulder College of Media, Communication and Information internship fair. We had a great time chatting with students about who we are and what we’re looking for and getting to know each of their unique personalities a bit better. Editorial – Editorial interns will primarily work in the newsroom for Law Week Colorado, a weekly publication focused on the law and legislature in Colorado. Interns will write one to two articles per week for the Law Week Colorado newspaper, post content to the Law Week Colorado website and social media pages and assist in research for articles and copyediting for the newspaper. Additional work opportunities may include shooting photos for publication in print and online, collaborating on podcasts or other multimedia projects and doing other communications work for Circuit Media outside the scope of Law Week Colorado, depending on interest and experience. Qualifications include solid written communications skills, social media and WordPress proficiency. Ideal candidates will have some experience writing or editing for a school newspaper, website or professional publication and some multimedia experience. Technical Communications – Technical communications interns will primarily work with members of our communications team to enable our clients to effectively communicate and compete in a rapidly changing environment. Interns must be detail-oriented; have excellent research, writing and copy-editing skills; knowledge of AP style; good communication skills, both oral and written; enjoy working in a collaborative team environment and with people. Experience in both traditional and innovative communication techniques is important. Ideal candidates will be great communicators and will be comfortable writing in a variety of styles. Willingness to learn and ability to adapt is key. Multimedia – Multimedia interns will primarily work with our in-house creative group, Locus Studios, to assist in the production of creative projects for our clients in the legal and government sectors. The multimedia intern will support our team with their knowledge and/or experience in a variety of multimedia and design projects. These projects could include web design, web development, photography, video production, and some print design as needed. The multimedia intern will support the creative team’s efforts to produce high-quality creative products in both print and digital formats. Qualifications include a demonstrated knowledge of the Adobe Creative Suite, WordPress, and traditional art mediums. Ideal candidates will have experience producing creative print marketing collateral, photo/video projects, and developing web designs into live sites.